Suzuki Dr350 Job lot Spares Or Repair. 2 of the Engines are from stolen recovered bikes so no numbers present unfortunately but one set of cases here does have numbers but are unusable due to damage. 1x frame with no numbers/logbook. Hundreds and hundreds of pounds worth of brand new genuine Suzuki parts (mainly engine parts- main bearings / cam chain / gaskets etc to build one of the engines) but also have genuine black side panels and rear Mudguard. Loads of new aftermarket parts including a brand new EBC dirt digger clutch plus tonnes and tonnes of secondhand spares. 385cc Wiseco Piston and Barrel to suit including gaskets all new. I have had this bike for around 17 years and stripped it down to carry out a major overhaul, I ordered most of the parts and had most work done but then bought another bike so this got sidelined and unfortunately now I can’t see me having time to complete it. I didn’t realise there was quite as much as there is until I started gathering it together to advertise it. Someone will either make a killing on this lot if sold individually or will have a very nice example of a dr350 if they have the time and knowledge to rebuild this. Any questions please message through EBay or direct on 07725915690 as I’m not always in a good internet access area. Please make sure you speak to me and understand what you are buying before bidding. I don’t want to break it up I want it all gone in one sale if possible. 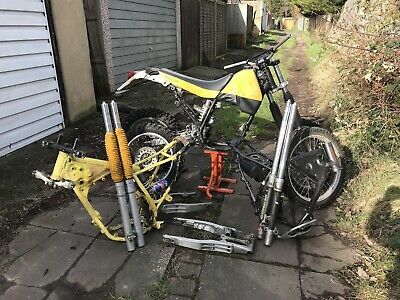 This Suzuki Dr350 Job Lot Spares Or Repair is located in Dartford, da2 6jd and is being sold on eBay by scotty2hotty100.